A campaign initiated by the FRC, conducted in cooperation with partners sensitive to the defence of consumer rights and the fight against the grey ticketing market. Never saw my ticket… On the wrong side! I paid way too much! 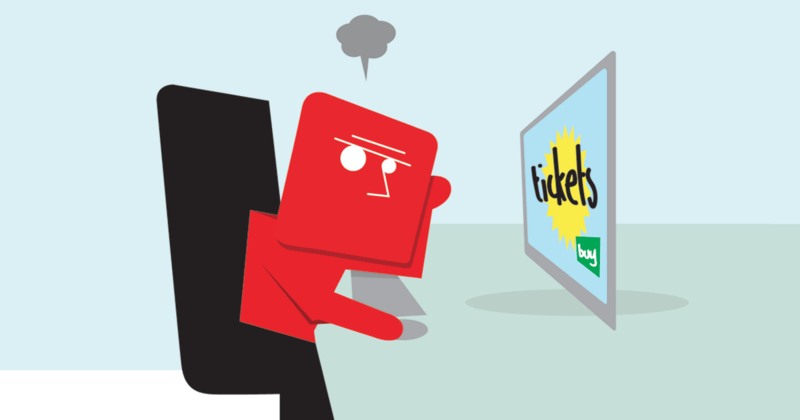 The Fédération romande des consommateurs (FRC, the consumer federation for French-speaking Switzerland) receives complaints daily from people who feel they were cheated when they bought tickets online. When using Google or Bing, do not click blindly on the links at the top of the list of search results. Consumers believe they are on the official box office site. Have you fallen for such practices? Have you paid twice or even three times the normal ticket price? Were you unable to choose your seats? Did you never receive your ticket? Were the time and date of the concert wrong? Was your seat in the opposite team’s fan zone? You are 42 years’ old but were issued a children’s ticket? The ticket delivered was for a lower category than you had ordered? You bought seating tickets for an open air festival? We encourage you to report incidents (if your bad experience is ongoing, check our online help file). Your testimony gives weight to our cases aimed at enforcing consumer rights. Warning: unauthorised vendors pay to be at the top of Google and Bing search result lists. Authorised ticketing offices are indicated on the promoter’s website. Warning: unauthorised vendors often announce that concerts are nearly booked out, drive up prices and use timers and/or other devices to pressure consumers into hasty purchases. Seating availability and the official prices are indicated on the website of the organiser’s partner ticket office. Tickets are often still available. The terms and conditions are indicated on the promoter’s website. Unauthorised vendors are present at all types of events and invest considerable means to secure the top places on browser lists. The only defence against these practices is to warn people about the pitfalls of buying tickets online. If you know anyone who has been entrapped by such practices, invite them to send us their testimonial. Make a donation to the FRC. Your donation will help us reach more people with our campaign and enable us to pursue legal and criminal proceedings. Are you a sports or entertainment professional? To keep abreast of FRC’s action against the grey market, follow our file (in french). Read more: SMPA file on the secondary market (in german).